Since you are interested in things visual, I thought I would take a shot in the dark and ask you if you have any thoughts on the art of cartooning. I wouldn't expect you to, but I wouldn't want to miss out on the off chance that you did! It is sometimes hard to tell what is a cartoon and what is not; let's think about this in terms of explantory/narrative illustrations with images and words done by hand. At least that is how one might see cartoons from the point of view of information design. The cartoon style is sometimes good in explaining things; the words are right there with the illustration, complete text-image integration produced by the same hand behind both text and image. And the mind behind that hand has to have a good understanding of the content--usually--in order to produce the narrative illustrations. Of course readers don't expect to see original scientific evidence reported cartoon-style; the cartoon style for serious evidence would compromise the credibility of the report. A wonderful book on the underlying syntax of comics is Scott McCloud, Understanding Comics. Leonardo da Vinci, the amazing set of anatomy illustrations done around 1510-1515, as well as Leonardo's art notebooks (see, for example, Martin Kemp and Jane Roberts, Leonardo da Vinci (1989)). The scientific illustrations of Roger Hayward in several classic science textbooks. See his illustrations in Linus Pauling, General Chemistry and in John Strong, Procedures in Experimental Physics. The aviation books in the 1940s written and illustrated by Assen Jordonoff. Many magic books have excellent hand-drawn images; see lots of examples in the magic chapter in my Visual Explanations. And there is a funny Kliban opening up that chapter.That chapter also has a discussion about the merits of photographs compared to hand drawings. Jay Ryan is doing interesting work in his monthly cartoon strip "SkyWise" now appearing in Sky & Telescope. The cartoon short stories of Harvey Pekar (drawn by different illustrators/cartoonists) are quite powerful and moving. And of course for very high-level current work in traditional cartoons, The New Yorker. Art Spiegelman did a wonderful three pages on the work of Charles Schulz and Charlie Brown several years ago in the New Yorker. The New Yorker and the Cartoon Bank have an impressive website for seeing their cartoons and buying originals, copies, or permission/reproduction rights ($15 to use your favorite New Yorker cartoon in your PowerPoint presentation!). My father was an advertising illustrator trained at what is now the School of Visual Arts in NYC, then known as the Cartoonist and Illustrator School. In the late 1950s he did his tour in the Army, and based on his skills he spent much of his time creating instruction manuals and pamphlets for operating heavy ordinance. He showed me some of these when I was a child, because they were done in cartoon form. I thought it was weird that you would use a comic book to learn how to fire a large gun, but he said that it was needed because many (drafted) soldiers did not have the reading skills to follow traditional manuals. Binding images and words in a format familiar to most boys growing up in the 40s and 50s seemed to work. The goal was to have people get the instructions right, since mistakes could be deadly. Last weekend I was reminded of Ray Yelle's thoughtful contribution as I assembled--(with ease!) --a toy scooter for my one-year-old daughter. The "Instruction Sheet" was really just a comic strip showing the pieces magically floating into place without any human intervention. Really wonderful, and not "dumbing down" at all, I think. Imagine how horrible it would be to put together a toy or a model or a dangerous weapon if, instead of wordless diagrams, there were just words..."slide axle through hole in top of handlebars and place small pink axle-cover on handlebar end of axle, then lean on top of smaller black plastic damper and hammer other end of axle..."
As a cartographer I often turn to my comic book collection for inspiration, especially when doing challenging multiple variables maps in B/W. Kazuo Koike & Goseki Kojima 's "Lone Wolfe and Cub" series, now being released in English Translation (from Japanese) by Dark Horse Comics. The works of Ben Katchor. The very clean and straigthforward Optic Nerve by Adrian Tomine is perhaps the most important comic in this vein only matched by the creations of Chris Ware,creator of Jimmy Corrigan, whose work sometimes graces the pages of The New Yorker magazine. Drawn and Quarterly, and The Beguiling (www.beguiling.com) are both good sources for all of these works. In passing, none of these works are of the super-hero genre. Another response mentioned Scott McCloud's "Understanding Comics". He's got another book called "Reinventing Comics" that gets into the issue of what comics might turn into on the web. His web site has some examples of his own work and links to others. His web site is at http://www.scottmccloud.com and is well worth visiting if you're interested in comics. Many thanks for your kind words about my humble scrawlings, though I've "retired" due to the press or priorities. Also, thanks for including me in such a distinguished list! Of course, let's not fail to mention the legendary Will Eisner who pioneered the idea of educational comics in the 1950s. 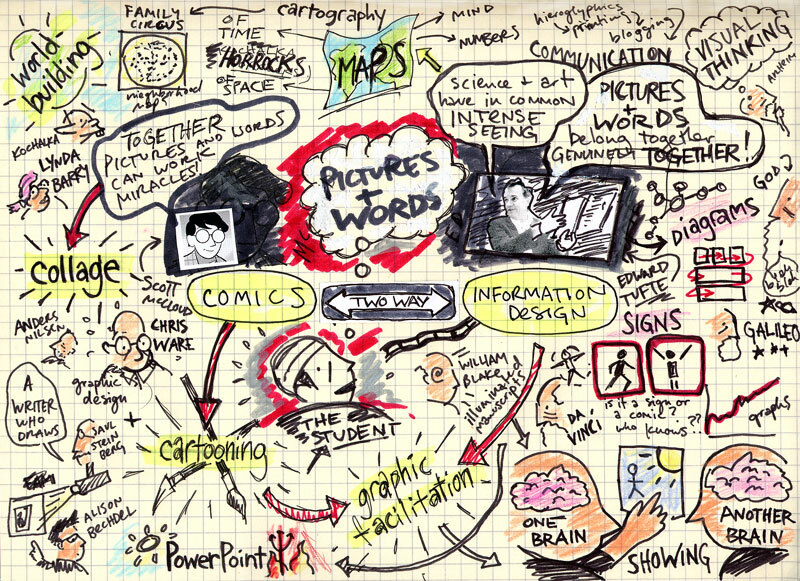 His recent work "Comics and Sequential Art" is a masterwork on the subject of pedagogy via the visual cartoon medium. To redress the gender balance, Kate Charlesworth is an excellent cartoonist whose work appears in the New Scientist from time to time giving one-page explanations of "Life, the Universe & (almost) Everything"
Surely ET would be pleased with the content of the cartoon on page 97 of the September 29, 2003 issue of The New Yorker. Any thoughts on the use of cartoons to make learning a subject fun? I am thinking of Larry Gonick's cartoon guides (Cartoon Guide to Statistics, Cartoon Guide to Genetics, Cartoon Guide to the History of the Universe...). I've read some of this books just because they're fun, and others to get an enjoyable overview of a new topic I need to learn about. He's fantastic! "I need someone well versed in the art of torture--do you know PowerPoint?" Readers of this forum/thread might be interested in Larry Gonick & Woollcott Smith, The Cartoon Guide to Statistics (New York: HarperCollins, 1993), which is much better than one would expect it to be. I just wanted to point out two more examples of using cartoons as step-by-step instructions. The first is assembly instructions for office furniture I recently purchased from OfficeMax. The illustrations had to be very high resolution (this wouldn't have worked on a PC display) so you could see which screw was being used, and how to get it right on panels that had nearly symetrical counterparts. One benefit of these guides is that they don't need translation into other languages, even for people who read no languages. The producers of "This American Life" devised a comic book to present the basics of radio production and the peculiar narrative style of TAL. It struck me as a very good way not just to present the information but to telegraph the tone of the program. You can see it at <http://www.thislife.org>. The site uses frames, so click on the link "For educators" and look for the link to the comic book ("Radio: An Illustrated Guide"). I have been at work on a book about the Transcontinental Excursion of 1912 for several years, and have several years' work to go on it. Although I am an academic, I am writing the book for a more general audience. I sometimes have a hard time getting across what's interesting about it in the equivalent of a ride on the elevator. So I have been working on a comic book to get it across. This is appropriate enough, since maps and landscapes are an important part of the story. I do not yet know whether I will have the moxie to send the comic book to publishers when it comes time to find a publisher. I've read this thread and found it very interesting. I agree that comic type illustrations can be very effective in communicating ideas and information. But they obviously take a lot of time and skill to create so they aren't practical for high volume or quick work. I've seen nice step-by-step diagrams that effectively show how processes work in magazines. I am looking for clip art that has a large variety of nice looking iconic images of people, furniture, machines, etc., all in the same style that could be combined to create this sort of diagram without having to draw it. These would be semi-realistic looking images, not "cartooney". Any suggestions about where I could find this sort of thing? I second the recommendations of McCloud and use of comics in instructions such as IKEA or Lego. As an illustrator and interaction designer, I can think of several other uses that haven't been described yet. First, ocmics are often used as storyboards. Because of the innate ability to communicate time traversal in the form, we can use it to illustrate ideas for animations, movies, and of course, interfaces. The Matrix, Hellboy and many other movies employ artists from mainstream comics to do their storyboards. Equally, in industry, I often use storyboards to communicate a flow (or expected flow) in an interface. As some have pointed out, comics are also great at being a lighter way of reading about a topic but require an intense amount of work and skill. Consider the format of today's webcomics, however. A 5-year running comic on vidoe games, Penny Arcade usually include editorials tied in with their strip. The text provides additional context and more depth in the topic. I've taken this concept into a more serious realm with interaction design, HCI and usability in OK/Cancel. Shameless self promoting aside, I think it's important to point out something we almost accidentally stumbled upon which in hindsight seems obvious. Comics are time consuming to draw but offer a fun and accessible way of talking about a subject. Once we introduced our topic with a comic, we then talked in much more depth in associated essays. It turns out that the readership becomes split approximately 50/50 in which they come to the site for more. Making a long story short, comics and cartoons are useful for storyboards and also for introducing a subject. Used alone, they are powerful but used with associated and closely tied text, they offer readers more options and lessen the need to illustrate an entire essay in comic form. Tom Toles, the powerful and unusual political cartoonist, has started to publish his unused working sketches as well as the published cartoon for that day. It is quite interesting to see the drafts of a skilled, quick cartoonist in action. I was listening to an NPR broadcast about the topic of copyrighted material and 'fair use'. The broadcast included a reference to a comic book produced by several Duke Univ. law professors exploring the issue of 'fair use'. Here is the reference to the comic book: http://www.dukenews.duke.edu/2006/03/comic_book_print.htm and the url to the comic book itself: http://www.law.duke.edu/cspd/comics/zoomcomic.html. What a delightful thread! It's nice to see most of the major comics artists making the forum. As a storyboard artist who moved into education (I teach high school English), I wrestle with the profound attraction of pictures & words for my students. As a teaching/presentation tool, the "quick sketch" is extremely powerful; its history goes back to Vaudeville with its greatest star being Winsor McCay of "Little Nemo" fame. Sketching out a graphic/text diagram on a board while lecturing -- for instance, mapping a complex narrative like a Dickens novel with a timeline and storyboard-type sketches -- has all the power of a laser-pointer on a slide but goes further by showing the kids that stories are actually constructed out of linked moments. That may sound obvious to us now, but most kids in the age of high-tech entertainment feel that digital graphics are "designed" but story just "happens". The virtue of cartooning, then, may be that it's fast enough, raw enough, that we can see the power of the sequences. Scott McCloud wrote a beautiful chapter using Japanese Manga and Herge's "Tintin" as examples -- physical realities such as backgrounds and cars are best drawn realistically, but a cartoonish protagonist allows the reader to place him or herself into the action. Reader involvement is still a vital part of information analysis, and as ET just underscored in his excellent NYC talk this week, we should "use whatever works" to bring information to the people who need it. ...of course, it's more complicated than that, but that's why this is such a useful forum. From the blog of Mark Kennedy, an artist in the animation and film industry, is a high quality scan of a 1970's presentation given to internal Disney artists to help them with story boards. Disney cartoonist Carson Van Osten created this "Comic Strip Artist's Kit" and gave presentations based on it. Appartently is has been floating around on ever degrading photocopies among artists for years. You may find this clean copy helpful. The video is animated entirely with pixel art (one click at a time) and showcases many iconic visual maps and designs. Beyond the interesting method of creation, it's the first music video I've ever seen to feature different types of information design graphics. The narrative weaves typical daily routines with related graphics in a simple but amusing way. Enjoy. The Royksopp - Remind Me video is already posted on our thread Music Videos and Information Design also with such classics as Senator Stevens' "A series of tubes." I think Scott McCloud's new book, MAKING COMICS, has a lot to say not only about the nuts and bolts of creating comics, but also about design choices when it comes to depicting any kind visual narrative. The link at the top of Martin Hardee's thread leads to an interesting interface critique via a storyboard. You might get a laugh out of this impromptu data visualization piece; it's a hilarious Tufte tribute. "First off: you will notice that this issue of The Nightly News lacks the customary information graphics many of you have grown to know and love. I apologize but there was too much story to tell and not enough space. But worry not good reader; next month is Tufte's revenge. Infographic haters beware!" Issue 4 also includes the full CMY chart of the colors he uses in the book. Howtoons illustrating the Beaufort scale. Notice the sailboat, the umbrella, the cellar. What other details can you find? Know you guys are busy but hope no one missed this one. Sorry about all the blank space. I'm not a graphic expert. for quite some time... see above ( 2001 ). Scott, if you are reading: Well done. Note that the McCloud Chrome comic has a Tufte reference on Page 20. Nate Piekos has a great article, Comics Grammar and Tradition. I would especially like to find out if the breath marks are in UTF-8 or unicode somewhere. Scott McCloud's definition of comics seems relevant to Tufte's overarching premise for good analytical design -- "Juxtaposed pictorial and other images in deliberate sequence, intended to convey information and/or to produce an aesthetic response in the viewer" (Understanding Comics, p. 9). This spatial juxtaposition is key; McCloud contrasts comics w/ film, which projects images over time in the same space: "Space does for comics what time does for film" (p. 7). McCloud's definition, buy the way, explicitly excludes one-panel cartoons like "Family Circus." But R. C. Harvey and others would argue that these, too, rely on juxtaposition -- of images and text. And McCloud's analysis of word/picture interaction (ch. 6) relies on image/text juxtaposition within a single panel. Finally, Thierry Groensteen's important book, System of Comics, has now been translated into English (trans. Bart Beaty and Nick Nguyen; Univ. of Mississippi Press). It concerns itself often with larger-scale design patterns across the page and across two-page spreads, rather than only the panel pairs McCloud focuses on. As others have pointed out, there are all kinds of interesting visual experiments going on at http://scottmccloud.com. See esp. his webcomics, which take advantage of the browser space as a window. My browser/OS (Firefox/Windows XP) does not currently support these unicode characters, but they are out there! Does anyone know a font that renders these? In this short RSA Animate, renowned philosopher Slavoj Zizek investigates the ethical implications of charitable giving. RSA Animate-First as Tragedy, Then as Farce from The RSA on Vimeo. 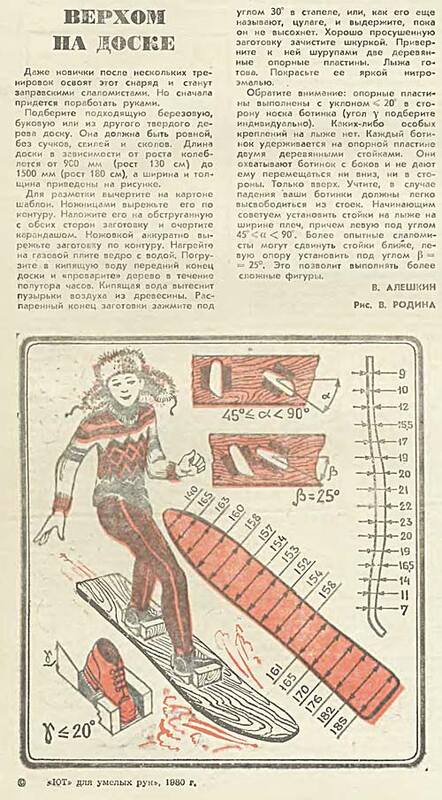 The Russian kids magazine "Yunyi Tekhnik" published these hand-drawn DIY designs of a snowboard (1980) and kite skiing (1978) made by V. Rodina. 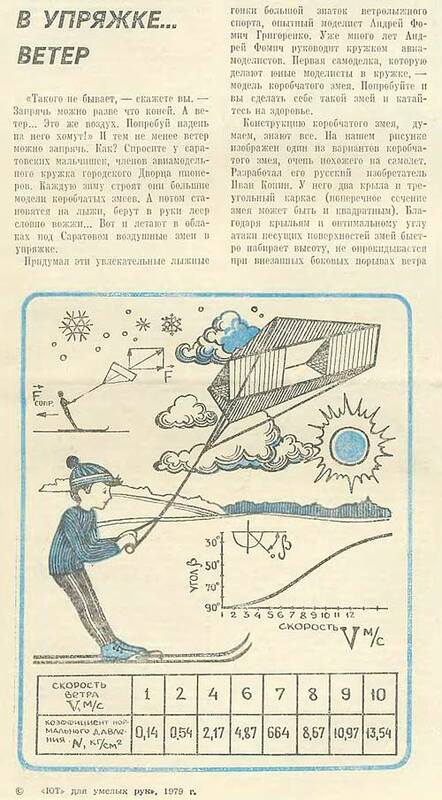 The table under kite skiing shows the relation of wind speed V (meters/second) and pressure coefficient N (kilograms/sq. centimeters). The timeline paintings of Ward Shelley are an interesting blend of informational graphics and cartoon art. One of his works is a re-imagining of the Albert Barr modern art flow chart. The mouseover text reads: "The contents of any one panel are dependent on the contents of every panel including itself. The graph of panel dependencies is complete and bidirectional, and each node has a loop. The mouseover text has two hundred and forty-two characters." There is this new style of cartooning, video cartooning, that mimics chalkboards. There is something here about the nature of learning, seeing the idea built up, seeing and hearing and understanding across the corpus callosum, that is lost with PowerPoint, but comes to life with a chalkboard. I think RSA pioneered it, and Jorge Cham of PhD Comics has done a great one on the Higgs Boson. These appear to be done directly on a whiteboard. Can they be done in Illustrator or some other app? Dog cartoons: Whose hermeneutic shall prevail?